A few months ago I was once again asked to direct a show for a great local charity. I said yes, of course. The whole point of the show was to raise money; it was billed as a theatrical fundraiser. So, naturally, I decided on The Importance of Being Earnest, a fantastically funny 19th century play, still relevant today, with some of Oscar Wilde’s best biting wit. We had secured a beautiful theater that had just undergone a multi-million dollar renovation, and I had already made my preliminary director’s notes. The problem: in order to do it properly, it would have cost more than what the ticket sales, donations, and concessions brought in combined. The poster from the improv show. The large, yellow head was easy to spot, became recognizable, and is simple to incorporate onto merchandise and promotional materials. Not a very effective fundraiser. That, and the time constraints and scheduling constraints of my cast and crew made the show impossible to do properly – and this isn’t a play that you just “wing”. If I was going to do it, I was going to do it right. Instead, I decided to do an improv show with some of the same actors that had already signed on, because I knew their schedules were clear. My thought behind this was as follows: with the time we had, we could make an awesome show; I had enough actors; it was easy to stage anywhere; it was cheap; it has a high return of positive audience reviews (if done properly). An improv show was born – but it took many steps, lots of help, and hard work to get it to performance level. First of all, what is improv? “Improv” – short for “improvised” or “improvisation” – the act of creating something on the spur of the moment. Improv is regularly used in the education of actors – by not knowing what comes next, performers are required to listen closely and react naturally. Creating answers to questions such as “who am I?”, “where am I?”, and “what am I doing?” on the spot (and in front of an audience) is difficult, and requires incredible focus. It teaches the actor to live in the moment, and makes for a more realistic, emotional performance. Viola Spolin was a master of using improv for building character and strengthening the skills of the actor. She was a pioneer of improvisation and theater games, and if you’re interested in improv, you may want to read more about her (find her book on my resources page). Concept: Basically, everything I wrote above. 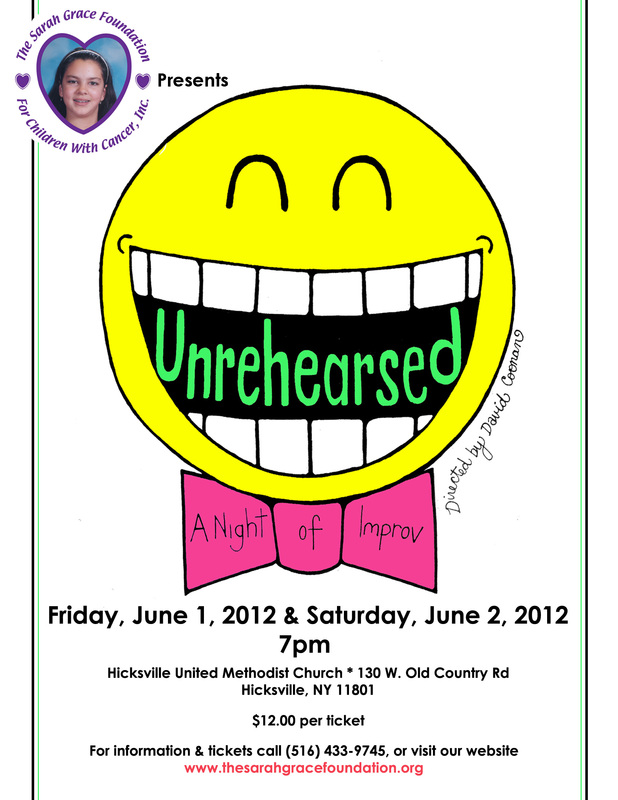 Something engaging, funny, fairly easy to do, and easy to rehearse in a short amount of time. Games: The games and the order of the games were very purposeful. In order to keep the actors fresh (and still improvising), they never knew the scenarios or who they were working with in a scene. They knew the games, but they never rehearsed the games in the order of the show until dress rehearsal (which was the night before we opened). Choosing games was very important: Good warm up games (Freeze Tag, Questions Only), more complicated games for the audience’s amusement (New Choice, Dating Game), and games involving the audience (Moving People, Sound Effects) all play into the overall feel and appeal of the show and change up the rhythm, forcing people to ask “What’s next?” – and that includes the cast. Cast: The cast should, ideally, consist of people who have worked together before and have worked well before. They don’t necessarily have to be actors in the traditional sense, but it doesn’t hurt. They should be witty, controlled, comfortable on a stage, and excellent at playing in the moment and off of other people. They also need great mechanics and have to know what is funny (poop) and what is not (death). Venue: The venue that we originally had for Earnest was a beautiful, newly renovated, large multi-million dollar theater. And that was the absolute wrong venue for the improv show. While a long room in a church basement with a low, shallow stage and low ceiling doesn’t like the classiest place to produce theater, it actually turned out to be the perfect place for this show. Improv needs to be intimate. There has to be audience engagement at all times, and every person sitting there should feel like he or she is contributing to the atmosphere. In order to make that happen, an element I incorporated were index cards, asking each audience member to write down specific suggestions for games that required original characters (Dating Game) or random lines of dialogue (Two Line Vocabulary, Scene With an Audience Member). These cards were collected, sifted through by my assistant, and then the best stuff was chosen for the performance. The technique actually makes the audience a part of the show, and it was a fun thing for them to do while they waited. Also, a smaller venue made it easy to (inexpensively) share information with the audience that the performers shouldn’t see – such as characters, lines, or their area of expertise (for Panel of Experts), via medium sized white boards and posters held over the performers’ heads. Information could easily be shared with the audience, because the front row was 2 feet from the lip of the stage, and the last row only 30-40 feet away. Marketing: The first thing I did was to come up with the name, then the logo, then the poster. That creates the brand. We put the logo on everything (including buttons – see my post about that), stuck it in every local newspaper and website attached to every neighborhood that every person in the cast or crew came from, and mailed 3,000 flyers to homes near the performance space in the charity’s hometown. The logo and name are simple enough to alter year after year so that we can make a franchise out of this show, if we so desire. That would be the smart thing to do. Movie sequels are made for a reason. Which games are the most interesting for the audience? Which games are the most interesting for the actors? Which games involve the most audience interaction? Who are the right actors? What is the right space/venue? 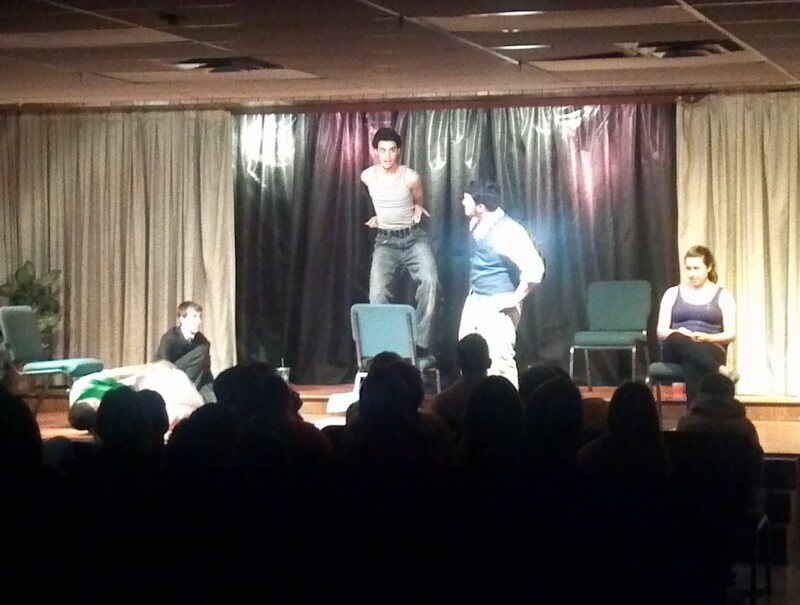 A scene from the improv show. These performers have incredible stamina. The objective – improvisers need to keep their eyes on the goal. The actor is acting and creating a character, even if it’s immediate and only for 2 minutes. A scene is a scene – always strive for that objective. Focus! Don’t go off on tangents. Move the scene forward, stay on track. Add to the scene, don’t detract. Seriously, listen to each other! There is only “yes”. Saying “No…”, “no, I’m not…”, “no, you are…” and anything similar are very easy ways to destroy a scene. You must go with the flow. Don’t try to move the scene in a given direction because you think you have some gem in your head ready to unleash on an unsuspecting audience who will appreciate your comic genius. Wrong. Forced funny is not funny. Screwing up an otherwise good game because of your ego just makes directors angry. Don’t ask questions, unless the game is about asking questions. Make statements – give your scene partners something to work off of. By asking open ended questions you’re putting them on the spot, and that’s not cool. You’re supposed to be working together. Make your host’s life easier. By this I mean give him or her an outline of the games, who’s in the games, the basic rules of the game, and a list of scenarios for him to choose from (that the actors don’t know about). This way he doesn’t have to memorize it and can focus on engaging the audience and moving the show along. Lastly, where do the games come from? Simple – they’re everywhere. There have been TV shows, improv troupes, books, and classes that have all used the same games under different names. I chose my games from a number of places: favorites from classes that I’ve taught, books, other improv shows that I’ve seen, and of course, that television show about asking whose line it is currently. The criteria was pretty simple – if I laughed, I seriously considered that game for the show. Search, look around, use your favorites. If you’re having fun, your audience will, too. If you’d like examples of materials I’ve put together or have used, please contact me. UPDATE: I’m very proud to say that this post helped a group of performers to start their own improv group in a Oslo, Norway. Read my interview with the group’s co-founder here.